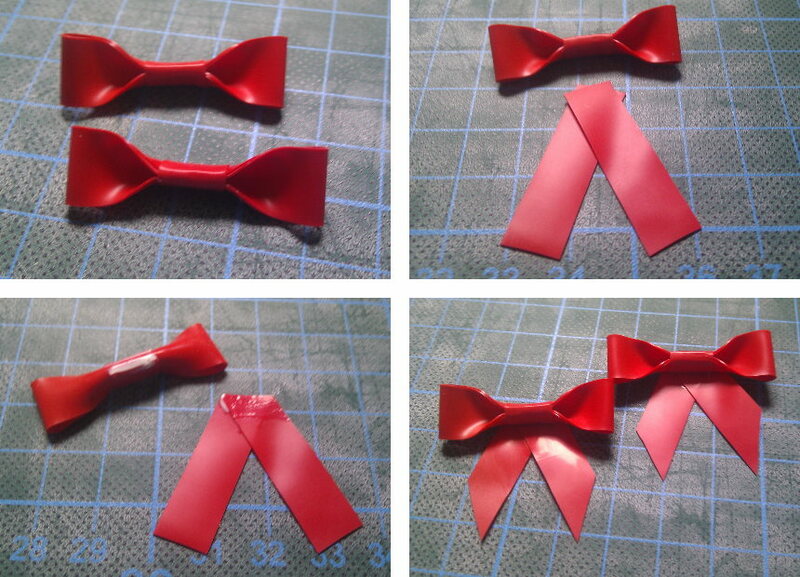 This tutorial shows how I made a couple of red latex bows for one of my next creations. 1. 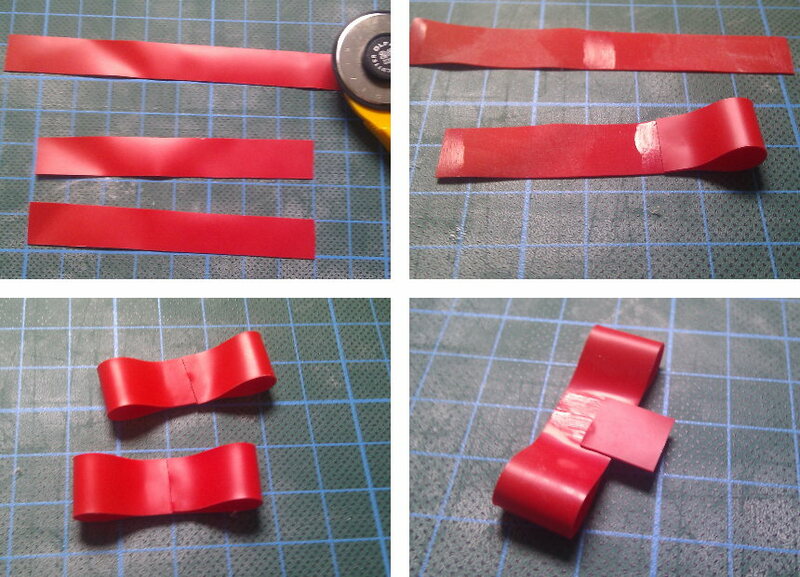 Cut pieces of 80mm length from a strip of 12mm wide and 0.35mm thick red latex. Change these measurements for smaller or larger bows (top left). 2. Clean each piece on the backside. Appy some latex milk to both edges and to the center. After the glue has dried flip and glue both edges to the center. Use a ruler or the grid of your working space for correct alignment (top right). 3. Use talcum powder to prevent glueing where unwanted on the finished bow parts (bottom left). 4. The knot is made from a 14mm long piece of latex that was cut from a 10mm wide strip. I prefer the knot and the loose ends to be a little bit smaller than the bow. Clean and apply latex milk to the back side of the knot and the frontside of the bow part. Glue half of the knot pice to the bow part, than roll the bow part, so you can glue the other half of the knot piece to the other side of the bow part (bottom right). This is the most difficult part. Practice before you glue! 5. The result should look like the bows on the images to the right (upper left). 6. 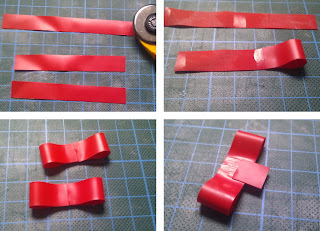 Cut the loose ends from the 10mm wide strip, approximately at a length of 35mm. Glue two pices together in a sharp angle (top right). 7. Cut the piece even on top, clean and apply glue. Also clean and apply glue to the back of the bow (bottom left). 8. Glue both parts together and cut the loose ends in form. The bows are finished (bottom right). Find another excellent tutorial on making bows on Making Latex Clothing.